CBI - China: Day 57 of 154 of the Japanese Invasion of Manchuria. Spain: Day 120 of 985 of the Spanish Civil War. CBI - China: Day 25 of 29 of the 1st Battle of Suiyuan. Spain: Day 485 of 985 of the Spanish Civil War. CBI - China: Day 130 of 2,987 of the 2nd Sino-Japanese War. Day 93 of 106 of the 2nd Battle of Shanghai. Spain: Day 850 of 985 of the Spanish Civil War. CBI - China: Day 495 of 2,987 of the 2nd Sino-Japanese War. Day 33 of 81 of Japan's Operation GUANGDONG. Atlantic: HMS BLANCHE strikes a mine and sinks off the Thames Estuary. She becomes the first Royal Naval destroyer lost in the war. ETO - UK: German bombers attack British territory for the first time, with a bombing raid on the Shetland Islands. No serious damage is done. CBI - China: Day 860 of 2,987 of the 2nd Sino-Japanese War. ETO - UK: Day 69 of 258 of the Blitz. MTO - Greece: Germany prepares to enter war against Greece. East Africa: Day 157 of 537 of Italy's East African campaign in the lands south of Egypt. CBI - China: Day 1,226 of 2,987 of the 2nd Sino-Japanese War. Day 365 of 381 of the Battle of South Guangxi. CBI - Thailand: Day 44 of 221 of the Franco-Thai War (Vichy France vs Thailand). Russian Front: Temperature on the Russian Front near Moscow drops to a bone-chilling -80°F (-62.2°C). The Russian (or Soviet) Winter is a common excuse for military failures of invaders of Russia. Common nicknames are General Frost, General Winter and General Snow. The severity of Russian winter is often linked to Russian military victories and the defeat of any army foolish enough to invade her. In 1707, in the Great Northern War, King Charles XII of Sweden invaded the Russia of Peter the Great. That particular winter was the most brutal of the 18th century, so severe that the salt water port of Venice froze. Charles' 35,000 troops were crippled, and by spring only 19,000 were left. The Battle of Poltava in 1709 sealed the end of the Swedish Empire. In 1812, Napoleon's Grande Armée of 610,000 men invaded Russia, heading toward Moscow. The Russian winter only had a major effect once Napoleon was in full retreat, but it added a very frozen insult to his injury. In WWII, the winter of 1941-1942 was again brutal beyond normal. 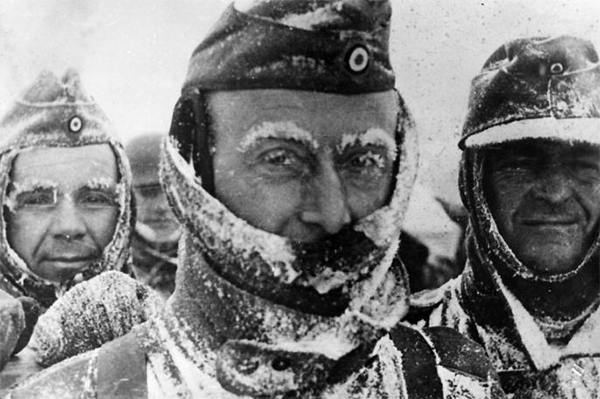 Hitler's plans for Operation BARBAROSSA miscarried before the onset of severe winter weather. He was so confident of a quick victory that he did not prepare for even the possibility of winter warfare in Russia. Perhaps we should all consider incorporating the phrase "invading Russia" into our vocabulary to describe trying to do something that historically is doomed to fail. USA: President Roosevelt announces the arming of American merchant vessels carrying Lend-Lease cargo to Britain. Congress votes by a small majority to repeal the 1939 Neutrality Act. Russian Front - Finland: Day 138 of 142 of Operation SILVER FOX, a joint German-Finnish campaign to capture the Russian port of Murmansk in the Arctic. Russian Front - Finland: Day 136 of 140 of Operation ARCTIC FOX, a joint German-Finnish campaign against Soviet Northern Front defenses at Salla, Finland. Russian Front - Finland: Day 145 of 164 of the Battle of Hanko. The Soviets will be forced off their leased naval base. Russian Front: Day 145 of 167 of Germany's Operation BARBAROSSA. Russian Front - North: Day 67 of 872 of the Siege of Leningrad. Russian Front - Center: Day 43 of 98 of the Battle of Moscow. Russian Front - South: Day 15 of 248 of the Siege of Sevastopol, Crimean Peninsula. MTO - Libya: Day 218 of 256 of the Siege of Tobruk. MTO: The British aircraft carrier HMS ARK ROYAL is torpedoed off Gibraltar by U-81 and later sinks. East Africa: Day 522 of 537 of Italy's East African campaign in the lands south of Egypt. CBI - China: Day 1,591 of 2,987 of the 2nd Sino-Japanese War. Russian Front - North: Day 432 of 872 of the Siege of Leningrad. Russian Front - North: Day 193 of 658 of the Siege of the Kholm Pocket, USSR lays siege to the Kholm Pocket but the Germans hold out for a about a year and a half. Russian Front - South: Day 139 of 150 of Germany's CASE BLUE, the failed offensive to take the Caucasus oil fields. Russian Front - South: Day 83 of 165 of the Battle of Stalingrad, bloodiest battle in human history. MTO - North Africa: Day 6 of 9 of Operation TORCH, the invasion of Morocco and Algeria. The US 12th Air Force provides air support. MTO - Libya: The British 8th Army captures Tobruk and Montgomery says, "We have completely smashed the German and Italian armies." CBI - China: Day 1,956 of 2,987 of the 2nd Sino-Japanese War. PTO - Alaska: Day 160 of 435 of the Battle of Kiska, Aleutian Islands. The US and Canada will defeat the Japanese invaders. PTO - Malaya: Day 268 of 357 of the Battle of Timor Island, a long guerrilla war ending in Japanese victory. PTO - New Guinea: Day 116 of 119 of the Battle of the Kokoda Track. The Australians continue pushing back the Japanese troops. PTO - Solomon Islands: Day 99 of 187 of the Battle of Guadalcanal. PTO - Solomon Islands: Day 2 of 4 of the Naval Battle off Guadalcanal. The naval battle intensifies into chaos. ETO - Germany: US 8th Air Force B-17s and B-24s hit the port area at Bremen and in the Kiel-Flensburg area. Russian Front - North: Day 797 of 872 of the Siege of Leningrad. Russian Front - North: Day 558 of 658 of the Siege of the Kholm Pocket. USSR lays siege to the Kholm Pocket but the Germans hold out for a about a year and a half. Russian Front - South: Day 82 of 122 of the Battle of the Lower Dnieper River, USSR. MTO - Italy: The US and Royal Air Forces provide air support for the Allied ground troops. CBI - China: Day 2,321 of 2,987 of the 2nd Sino-Japanese War. Day 12 of 49 of the Battle of West Changde. PTO - New Guinea: Day 56 of 219 of the Battle of Shaggy Ridge. PTO - New Guinea: Day 53 of 162 of the Battle of the Huon Peninsula. PTO - Solomon Islands: Day 13 of 295 of the Battle of the Bougainville Islands. ETO - France: Day 105 of 284 of the Battle of Brittany. ETO - France: Day 60 of 236 of the Siege of Dunkirk. ETO - France: Free French forces under General Leclerc attack from Alsace toward the upper Rhine. ETO - Germany: Day 56 of 145 of the Battle of Hürtgen Forest. Russian Front - Finland: Day 60 of 223 of the Lapland War. Finland and Russia have joined forces to kick the Germans out of Finland's most northern province. Russian Front - Center: Day 30 of 206 of the Battle of the Courland Pocket in Latvia. Russian Front - Center: Day 23 of 99 of the Siege of Memel, a border town of Lithuania and East Prussia. Russian Front - Center: Day 61 of 72 of the Battle into East Prussia and northern Poland. Russian Front - South: Day 16 of 108 of the Battle of Budapest, Hungary. Russian Front - South: Day 61 of 72 of the Battle of Belgrade, Yugoslavia. German troops evacuate Skopje. MTO - Germany: US 15th Air Force B-17s and B-24s hit the oil refinery at Blechhammer. CBI - Burma: Day 227 of 302 of the Chinese Salween Offensive in Burma. CBI - China: Day 2,687 of 2,987 of the 2nd Sino-Japanese War. Day 211 of 259 of Japan's Operation ICHI-GO. PTO - New Guinea: Day 322 of 597 of the Battle of New Britain. PTO - New Guinea: Day 206 of 481 of the Battle of Western New Guinea. PTO - Palau Islands: Day 60 of 74 of the Battle of Peleliu (Operation STALEMATE II). PTO - Philippines: Day 25 of 299 of the 2nd Battle of the Philippines, aka the Liberation of the Philippines or the Philippines Campaign. PTO - Philippines: Day 25 of 73 of the Battle of Leyte. PTO - Philippines: Day 3 of 41 of the Naval Battle of Ormoc Bay. France: General de Gaulle is elected head of the provisional French government. A lively and compelling autobiography of one of the first enlisted Navy WAVES in WWII. From joining the Navy to joining the mile-high club, Helen Gilbert's life was interrupted and forever changed by Pearl Harbor.